John McCain, is more important than any decision American voters have been asked to make in a generation, if not longer. This simple truth risks being obscured by the sheer volume of column inches, broadcast hours, and pixels dedicated to inflammatory pastors and teenage pregnancies, so we will say it again, plainly: 2008 matters. As a nation we are fighting two wars of still-uncertain outcome and trying to stave off a host of looming economic, environmental, and geopolitical crises. Our fiscal situation and health care system are nearing the breaking point. On all of these issues, Obama and McCain offer very different ideas. Rarely, if ever, has so much been at stake in an election year. she has done in the past, or said on the campaign trail, is a notoriously tricky business. Few people would have guessed that the Texas governor who inveighed against “using our troops as nation builders” during his first debate with Al Gore in 2000 would attempt to entirely remake a large swath of the Middle East two and a half years later. On the other hand, a closer scrutiny of George W. Bushs environmental record in Texas would have helped us anticipate his flat-footed response to global warmingand some important elements of his leadership style. The bottom line: you cant predict the future, but you can try to avoid nasty surprises. With this in mind, we asked eight of our contributing editors to consider the looming challenges that America is likely to facein the economy, education, the courts, and other areasduring an Obama or McCain presidency, and how, based on what we know about the two men, they are likely to handle them. 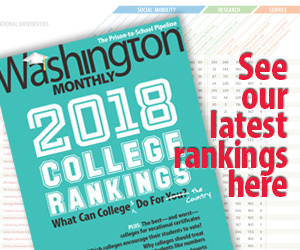 Jonathan Alter, Kevin Drum, Gregg Easterbrook, James Fallows, Nicholas Lemann, Stephanie Mencimer, Timothy Noah, Nicholas Thompson are Washington Monthly contributing editors.